Yesterday, I did something strange – I ran two races in one day. The British 10km in Central London and The Color Run just outside it at Wembley Stadium. They were my first official events for a loooong time. I’d forgotten silly little things like how pedantic I am about my race number being at exactly the right point – cue much swearing at safety pins at 5am when I rearranged it for the seventh time. I also discovered that ‘thick high protein yogurt’ is a really bad thing to put on cereal in a moving vehicle – it’s very sticky and I ended up with white smears all over my shorts before I’d even got to London. I also learned that I get very, very angry when start lines are disorganised. So angry I fume for about 3km – and run really fast. But I’m getting ahead of myself….let’s start at the beginning…. Note to Self: Fuel belt under number is not flattering. The race was due to start at 9.35am – so I got to bag drop about 8.15. The pre-start area was great. Really well organised, hardly any queues, about a 10 minute line for the portaloos which were clean and still had paper (note to anyone who hasn’t run a race before, pack loo roll – this isn’t always the case). I then walked the 1.5km to the start line – past Buckingham Palace with part of me hoping that I’d be there at the exact moment they brought out the little ‘It’s a Girl/Boy’ billboard because I thought that might be quite cool. I got to the start line, it looked good. I was pretty close to the first line of runners – in fact, although I had the opportunity to inch my way forward as there were loads of gaps, I didn’t move any closer as I’m not fast and so I didn’t want to get too far up front. Even when a few people starting jumping the fence I stayed put. Stupid, Stupid, Stupid Helen. England is currently having a rare moment of sunshine – really, really hot sunshine for here. As a result the start line was stifling. Packed bodies, no shade, but we’d got water so all was good. Not a lot of water mind as the nearest toilets to the start were back 1.5 kilometres so it was that careful balance of staying hydrated without triggering bladder-geddon. Then it got messy – the ‘pre-run’ entertainment overran. Then the Mayor gave a speech which no-one could hear but that seemed to go on forever – the result was a start delayed by 10-15 minutes – on a day when every minute counted in terms of temperature on the course – and in the start chute. This seemed poor organisation, but it was nothing compared to what followed. The first wave went out. We stood and we waited, and we waited, and we waited – for 25 minutes. Why, you ask when you were so near the front? Because it seemed they had opened the gates at the front of the course and let hundreds of runners in ahead of everyone who had stood at the back patiently waiting. I had gone from front third of the pack to last third. I was livid at this point. The start is so poorly designed. They say they can’t corral you due to the design – well, it looks very similar to the design of the Disney races to me and they manage just fine. Also, the fundamental flaw is that you approach the start from the front, it’s human nature to want to push in, and I’m sure that’s why they opened the fence to stop some kind of crush occurring from people jumping the fence. A simple redesign so you approach the course from behind would solve a lot of issues. I can honestly say that over the over 30+ events I have run in including races that have tens of thousands of entrants like Disney’s Half Marathon, Sydney’s City To Surf or Auckland’s Round The Bays this was the worst organised start line of them all. Once we got moving though all was fine – the course is pretty much flat and even though the temperature was scorching it was a nice race. My first 3km were pretty fast for me – 18 minutes – mainly because I was fuming after the start farce, but I soon dropped back to a more moderate pace. The water stops were plentiful – I think they’d added an extra one or two. And each one gave you a 330ml bottle which was great. It meant you could drink enough to rehydrate and pour some on your head to cool you down. Although I did discover that tipping water over your head a lot means that by 9km you feel as if you’re running wearing a nappy – a full nappy. I dread to think what I looked like from behind. There was some music on the course. Music planned by a person with a really sick sense of humour – who plays REM Everybody Hurts at a start line? I mean I question who plays that at all at an event, it’s not exactly woop, woop, woop but at the start?. The next PA had House of the Rising Sun – okay funnyman/woman in charge of the playlist it’s already up and we’re all boiling – and again, what’s with the depressing anthems? I think there were other music points en route but by this time I’d popped in a headphone and was happily plodding along to Gangnam Style and various techno greats. Support along the course was great – there weren’t really any dead points, just a tiny loop but that was after a waterstop and so you were happy anyway. I didn’t have anyone shouting for me (The Boyfriend was tucked up in bed reading the Sunday papers and resting for The Color Run that afternoon) but the general whooping and hollering kept me going. Plus there’s lots to look at on the course- including the other runners as it’s an out and back. I resisted shouting ‘queue jumper’ at regular intervals (just), though it’s very hard to do that ‘in with anger, out with love’ hand move while jogging so I might have snarled a little. 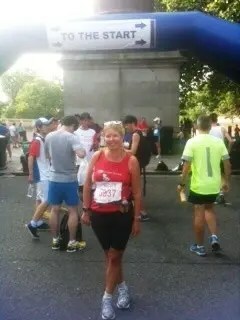 Heat did take its toll a bit – I dropped back by about 30 seconds a km every 3 km – and I did run past a lot of people really suffering from the heat, including a few getting medical assistance. Thankfully everyone seems to have come out unscathed, but I do wonder how much the start line delays had to do with the problems. I crossed the finish line at 1.10 and seven seconds – eight seconds off the time I wanted but I was happy considering. There was lots of water and gatorade for everyone – but no medals. It seems you don’t get a medal unless you go back to the bag drop – which was fine for me as I’d dropped a bag, but not for the girl in front of me who hadn’t and who didn’t want to walk 1.5km in the opposite direction to where she had to go. She was really angry. So what was my verdict? 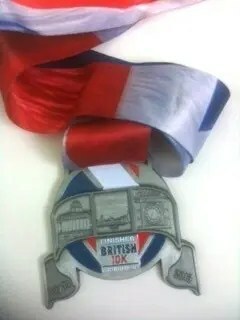 Great course, great support, dreadful organisation – and I probably won’t run it again because of that. So, did you run it? Was your experience any different? Was I just unlucky? Am I just being a grumpy Health-e-Helen? Let me know what you think. Tomorrow- let’s talk about The Color Run (it’s less angry I promise). Completely agree about the start. I was in the queue by the Bomber Command Memorial which seemed, when we first arrived, to be quite close to the start. Not so. And with the temperature rising by the second, we weren’t even aware of the mayor’s speech as we couldn’t hear anything. Now I don’t have a problem with Katrina and the Waves, but who thought it would be a good idea to make 20,000+ people frying in ever increasing temperature stand around for another 20 minutes while she sang a few songs that no-one could hear? Slow hand clapping was the result – we could hear that ok.
On the plus side – plenty of water stations. Don’t think I’d have survived with heat without them. Congrats on your time – very respectable. That’s exactly where I was too. Somewhere by the columns on the Piccadilly side. They were letting everyone through right next to me by the statues. Still seething.